Sure, moving your applications to the cloud and adopting more agile DevOps methods will save you money and make your complex application deployments more efficient but if you want the really big gains, focus the majority of your developers back on coding. According to Forrester Consulting, the gains from doing so are massive. Yes, re-hosting or even building cloud-native apps in VMs and containers will give you big gains in agility and cost savings but asking your developers to manage configurations, update the OS and middleware and pick the right virtual resources to support their apps (let alone manage the security of their deployments) is a distraction that cuts into their productivity. The modern cloud era is not IaaS-centric but modern app-centric. By taking advantage of the market-leading portfolio of Azure Platform-as-a-Service (PaaS) services and our partner PaaS platforms including Cloud Foundry, EngineYard and more, innovative applications can be built and deployed faster, scale automatically and easily connect to and incorporate the many powerful Azure services including search, big data, machine learning, advanced analytics and IoT. Building apps using Azure Functions, Azure App Service, PowerApps and others eliminate the need for your developers to maintain the underlying system software or virtual configurations: Azure keeps the OS, database, containers and other elements up to date and properly configured with the latest version and patches – which means your developers can focus entirely on business value. PaaS brings you real business benefits. How much, you ask? 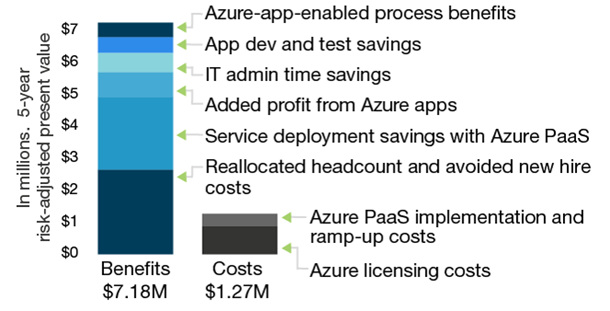 In its latest Total Economic Impact Study, Forrester Consulting interviewed a number of current customers of Azure’s PaaS services and concluded that concluded that migrating to PaaS from IaaS resulted in a 466% return on investment. For customers migrating from on-premises environments to PaaS, the return on investment can be even greater. Time to market also improved by as much as fifty percent, because of the efficiency and speed of deploying applications with PaaS services. Indeed, for a composite organization, Forrester estimated the overall risk-adjusted benefits of $7.18 million versus costs of $1.27 million over five years, as shown in the graphic below. Thinking about a new application? Your best bet is to write it as a PaaS application from the get-go. As Forrester notes, your developers will be more productive, not having to waste time on environment setup, verifying development and test environments match, and so on. Migrating to the cloud? Odds are, if your application is three-tiered (presentation, business logic, and database), as most modern apps are, it will translate well into a PaaS model, using Azure App Service for the Web front end, VM Scale Sets (perhaps with Service Fabric for scalable, always-on microservices) for the middle tier and Azure SQL for the relational database tier. Of course, that’s just the start. Once converted to PaaS you can easily leverage Azure services to add big data analytics, high bandwidth event ingestion from IoT devices and add chatbot capabilities. There’s no limit! Or as one customer, the founder of an IT services firm in the US, remarked, “Developing our app without Azure PaaS? Well, we wouldn’t have done it. Frankly, the extra time and resources required would have wiped out any profit that we have generated.” We made the full report available and encourage you to check it out! If you have been holding off on leveraging PaaS services, now is the time to revisit that decision. You can empower a broader set of your developers leveraging PaaS services, ensure more consistent scalability, security and customers satisfaction, knowing that deployment best practices are being used by default. And leave security, operations efficiency and recoverability to those who are trained, trusted and empowered to do this right – Azure and your IT operations professionals. This Forrester Consulting study also found, the time required by IT professionals to manage and administer applications (software upgrades, patching) was reduced by as much as eighty percent and thus less people were needed for these functions, meaning staff could be reassigned to functions more directly adding business value. So stop trying to turn all your developers into DevOps pros who have to build, manage and maintain VMs and containers. Coding is what you hired them for – so let’s them focus on delivering this value. And there’s more to come, so watch this space for more. But for now … Go for it!